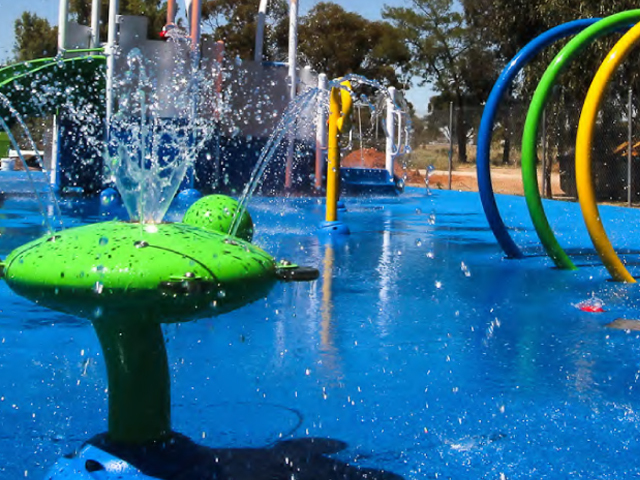 PolySoft has partnered with BIG4 Holiday Parks, one of the leading names in Australian holiday parks with 180 parks nationwide, to provide the innovative safety surface for a brand new $800,000 aquatic playground in its caravan park located in the scenic town of Swan Hill, Victoria, along the banks of the Murray River. lovely long, hot Swan Hill summers. 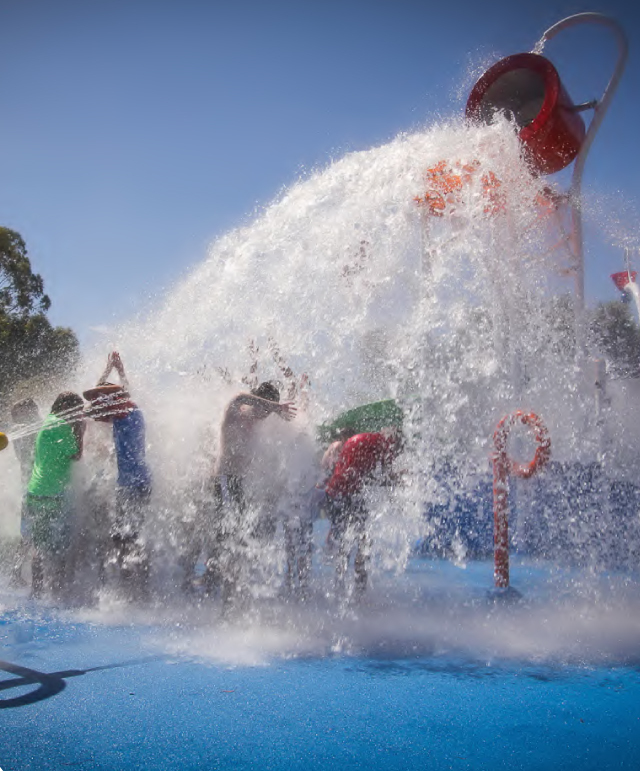 BIG4 invested in a brilliant Crystal Blue PolySoft surface to complement the multi coloured play equipment, consisting of three waterslides, an 8.5 metre super splash tipping bucket, spray cannons and interactive ground sprays, to keep kids entertained for hours on end. The appearance of the colourful polyolefin particle-based PolySoft surface at BIG4 Swan Hill Caravan Park follows the successful PolySoft surface installation and positive reception from guests and management at another BIG4 holiday park, North Star Holiday Resort in Hastings Point, NSW. PolySoft’s versatile qualities for wet areas, its durability and excellent safety standing, as well as its attractive appearance, were key factors cementing it as the surface of choice in the installation at Swan Hill, performed by the experienced team at RubberTough Industries, a certified PolySoft installer contracted to lay the surface. 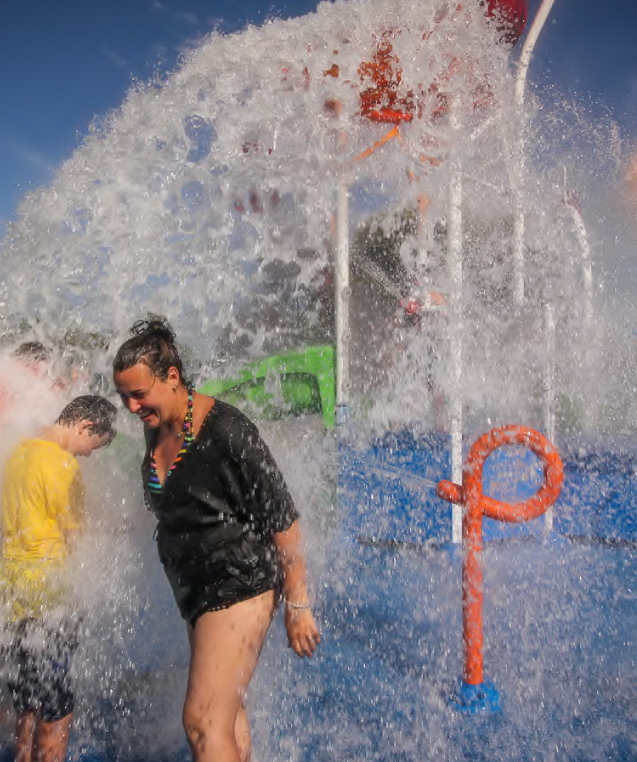 PolySoft is hygienic and non-toxic, possessing a high non-slip and impact attenuation rating, as well as anti-fungal and heat-reducing properties, enabling safer barefoot play for visitors to the water park under the hottest conditions. The pigments in PolySoft are also specially designed to resist the effects of UV radiation and chlorine, ensuring a bright long-lasting look, requiring a low level of maintenance. so if you are at the conference please drop past and say hello! For more information about PolySoft, please call our friendly team on 1300 308 037 or send us an email on info@polysoft.com.au. Visit us at www.polysoftsurfaces.com to view further examples of our installations.